Legend says that this dynasty began when a man named Yu drained the waters of the flood (a parallel story to the experiences of Noah). He became the first king of the Hsia Dynasty. 'Engraved Stone Dating Back 30.000 BC Unearthed in China'. Chinese archaeologists have discovered a stunning 30,000-year-old engraved stone artefact in a collection of stone tools unearthed at the Palaeolithic site of Shuidonggou in 1980. we believe that the incisions were made by intentional behaviour. Although we cannot be sure of the function of these incisions, the straight shape of each line shows that it was incised once over a short time interval without repeated cutting, implying the possibility of counting or recording at that time.” “Furthermore, creation of such an engraved object may indicate the possible existence of complex communicative systems such as language,” said Dr Peng, who reported the discovery in the Chinese Science Bulletin. “In addition to the engraved stone artefact, one ostrich egg bead was unearthed'. The Baigong Cave in China is the location of numerous ancient underground 'metal pipes' that were discovered in the beginning of the 20th century. 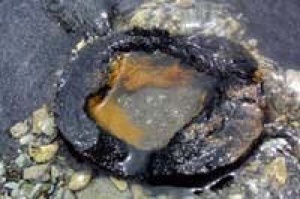 Traditional science has provided one or two explanations for their presence, but as yet there is no definite answer as to how or why the pipes exist where they do, as they run through the ground and even into the nearby lake. 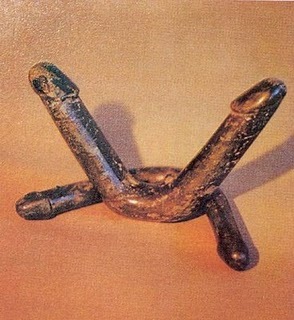 There is no evidence of an associated pyramid, as is normally reported, but the idea that they are fossilised tree roots remains unsatisfactory making the Baigong pipes one of todays more interesting modern O.O.P.Arts. These 24 hand-carved caves were only discovered late in the 20th century. Until then they were thought of as natural reservoirs within which villagers used to collect fish. 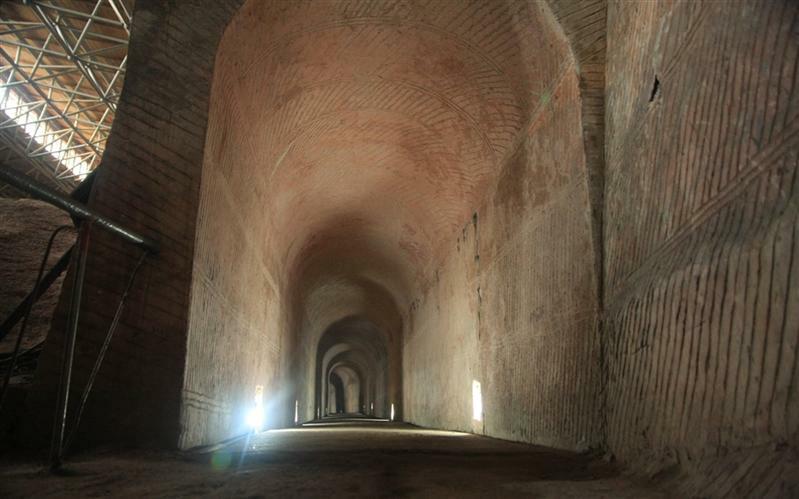 In 1992, a local villager decided to pump one of the caves of its water, revealing the startling immense carved chambers running as deep as 30m and covered with a beautiful pattern of chisel marks on all the walls and ceilings. Although the overall excavation involved almost a million cubic metres of stone, there is no historical record of them or evidence of the removed stone. Their origin is a complete mystery. Deep within China near the ancient capital city of Xi'an lies a series of pyramid-mounds virtually unknown outside the country until last century. The Chinese pyramid fields are now recognised as one of the greatest pyramid concentrations in the world. They have flattened tops, and are therefore more similar in shape to the South American pyramids than the pyramids of Egypt. 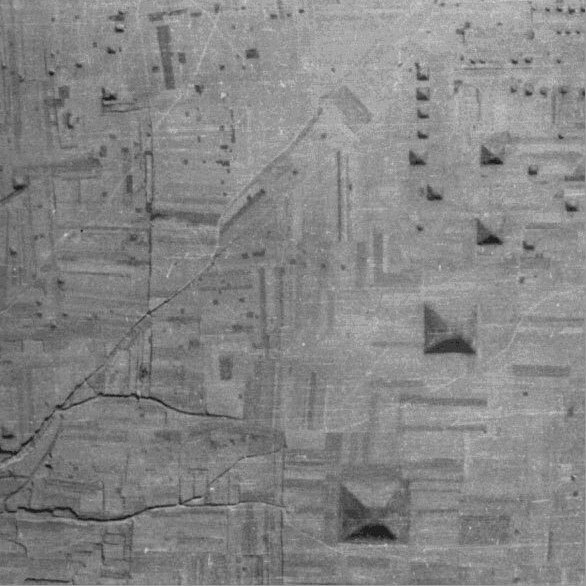 The image above is of the Ya-sen valley, Xi'an, in which the pyramids were all orientated cardinally. Most of the pyramids range from 20 to 200 ft in height and 50 to 600 feet in width. They are mostly found in an area of concentration NE of Xi'an and they all face exactly north, south, east and west. The oldest of these pyramids is believed to be the tomb of Qin shi Huangdi, first emperor of the Qin dynasty who unified China which makes them no older than 2,500 years old. The bone flutes excavated from the Jiahu ruins in Wuyang County of Henan Province is the earliest wind instrument found so far by Chinese archaeologists. The flutes dates back over 8,000 years. The largest is about 20 cm long and 1 cm in diameter, with 7 evenly-distributed sound holes of the same size. And a handful of such flutes have an extra small hole beside the last hole. 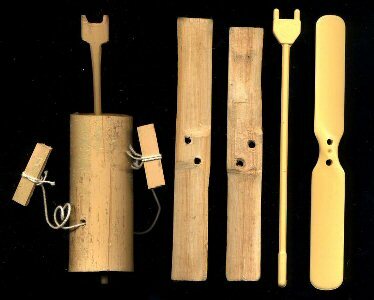 The making method and process of Jiahu bone flute are very much similar to those of modern-day Chinese wind instruments. According to zoologists' research, Jiahu bone flutes are made with crane ulna bones with the joints at both ends removed. Some bone flutes still bear the marks carved before hole drilling for even distribution, indicating the careful calculation Jiahu people conducted before flute making. The extra small hole on some flutes has been proved by scientists through tone testing to give out two variable sounds. Therefore, the hole serves as a tone adjuster. The flute reflects the amazingly high levels of tonality and calculation. Modern musicians can play the pentatonic-scale tune of Little Cabbage (Xiao Baicai) on the flute. These facts indicate that Jiahu people already had the basic ideas about the tone differences and tried to achieve the pitch accuracy. They also had rudimentary understanding of the relations between sound pitch and pipe length. 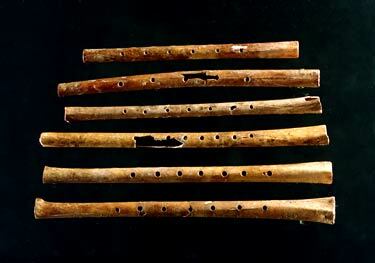 The discovery of Jiahu bone flutes has rewritten the history of Chinese music, proving that the seven-tone scale music was practiced some 8,000 years ago (7). In April 2003 Dr. Garman Harbottle of the Brookaven National Laboratory in Upton, New York, and a team of archaeologists at the University of Science and Technology of China, in Anhui province, announced that signs carved into what appeared to be 8,600 year-old-tortoise shells may be the earliest written words. 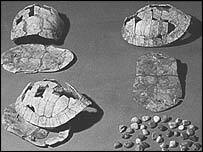 "The archaeologists have identified 11 separate symbols inscribed on the tortoise shells. "The shells were found buried with human remains in 24 Neolithic graves unearthed at Jiahu in Henan province, Western China. "The site has been radiocarbon dated to between 6,600-6,200 BC"
2637 BC - "This date has been conclusively shown to be the earliest one at which history notes anything resembling the application of the magnetic influence. It is related that, during this sixty-first year of the reign of Hoang-ti (Yeou-hioung-che, also named Koung-fen and Hiuen-yuen), the emperors troops, who were pursuing the rebelious prince Tcheyeou (Tchi-yeou), lost their way, as well as the course of the wind, and likewise the sight of their enemy, during the heavy fogs prevailing in the plains of Tchou-lou. 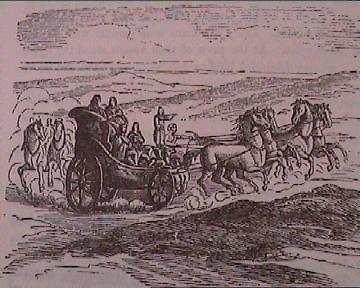 Seeing which, Hoang-ti constructed a chariot upon which stood erect a prominent female figure which indicated the four cardinal points, and which always turned to the south whatever might be the direction of the chariot. Thus he succeeded in capturing the rebellious prince, who was put to death. Phallic representations have been found in China that date back as early as the New Stone Age, that’s more than 12,000 years ago and most recently a tomb was uncovered from the Han Dynasty in Xian, China that was home to a rather interesting collection of phallus (see right). Researchers have uncovered strong evidence that the ancient Chinese used diamonds to grind and polish ceremonial stone burial axes as long as 6,000 years ago -– and incredibly, did so with a level of skill difficult to achieve even with modern polishing techniques. Peter Lu began the research in 1999, as a Princeton University undergraduate. He studied four ceremonial axes, ranging in size from 13 to 22 centimeters, found at the tombs of wealthy individuals. Three of these axes, dating to the Sanxingcun culture of 4000 to 3800 BC and the later Liangzhu culture, came from the Nanjing Museum in China; the fourth, discovered at a Liangzhu culture site at Zhejiang Yuhang Wujiabu in 1993, dates roughly to 2500 BC. 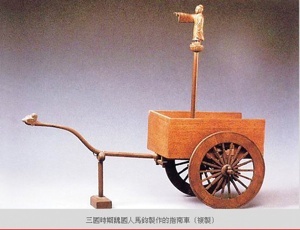 "What's most amazing about these mottled brown and grey stones is that they have been polished to a mirror-like lustre,"
Taketonbo; The "Bamboo dragonfly") is a Chinese children's toy invented around 400 BC (4). It essentially consists of a propeller on a stick, and rolling the stick in the right direction spins the propeller, causing the toy to "take off" when it is let go of. The bodies are far better preserved than the Egyptian mummies, and it is sad to see the infants on display; to see how the baby was wrapped in a beautiful brown cloth tied with red and blue cord, then a blue stone placed on each eye. Beside it was a baby's milk bottle with a teat, made from a sheep's udder. Based on the mummy, the museum has reconstructed what Cherchen Man would have looked like and how he lived. The similarities to the traditional Bronze Age Celts are uncanny, and analysis has shown that the weave of the cloth is the same as that of those found on the bodies of salt miners in Austria from 1,300BC. 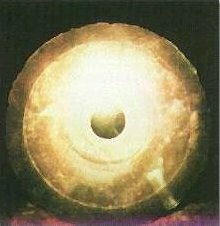 The 'Dropa' Discs refer to a cache of small round discs (and small bodies) reportedly found in a cave on the Chinese/Tibetan border in 1938. The story has gained the status of a modern myth in recent times, perhaps because so many of the integral facts of the tale remain entirely unverified. China has long been home to a cultural art form in which jade (stone) discs were carved and called 'Bi Discs'. They were a status symbol, commonly found in burials from the Neolithic period onwards. The most recent examples were more ornately carved than those from the Neolithic. List and description of Polynesian sites . The 'Navel of the Earth'. Nan Madol. City built on coral reef. 3). Paul. F. Mottelay. Bibliographical History of Electricity and Magnetism. 1922. Charles Griffin and Co.
4). Leishman, J. Gordon. Principles of Helicopter Aerodynamics. 2006. Cambridge University Press.